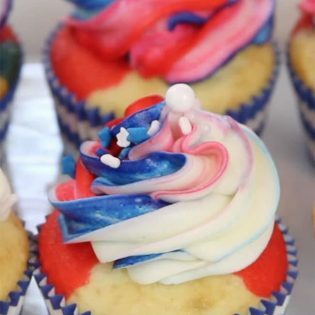 If you are looking for patriotic cupcakes for your next party, these Red White and Blue Cupcakes are sure to spark their attention and earn salutes at any Memorial Day and 4th of July celebrations. 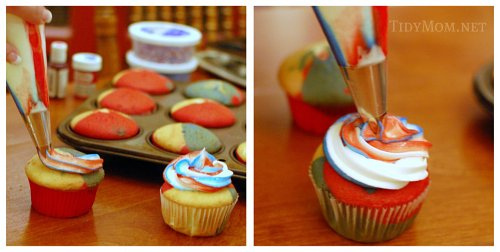 If you are looking for an impressive treat for your 4th of July celebration, look no further. 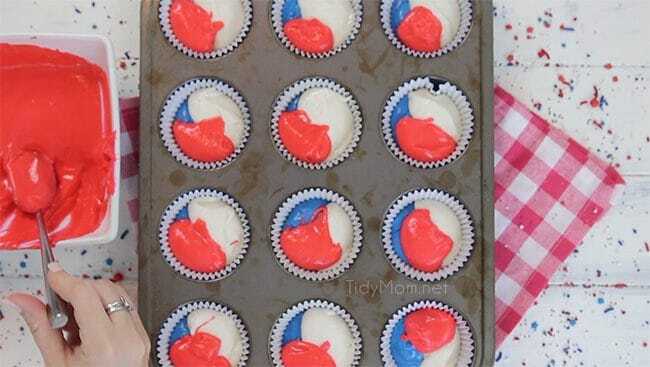 These patriotic cupcakes are too cute, a box cake mix makes it easy and they are sure to be a hit with the kids. Disclaimer- yes, I’ve heard all the “evil” about food coloring in food…..if this bothers you, please just close this post. I’ve seen these cupcakes around the web for a while, like here and here and I’ve been looking forward to trying them myself! I will say that I was thrilled with the results! They turned out even cuter than I had hoped for. 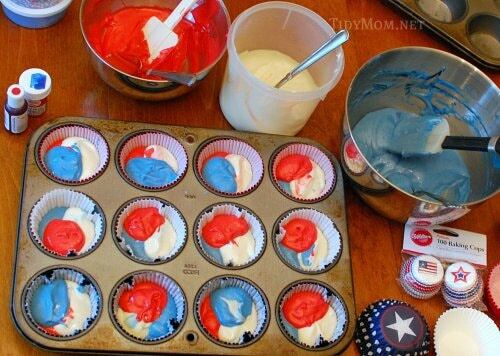 Let’s Make Red White and Blue Cupcakes! Divide your white cake mix into 3 bowls. Add red gel coloring to one, and blue color to another. I highly recommend using the gel-paste food coloring. The color is concentrated, so it does not require a lot to achieve the hue you’re going for. The liquid food coloring from the grocery store will “water down” your batter. Spoon a little of each color into your cupcake liners, filling about 1/2 full. Bake at 350° for 20 mins. and let cool. 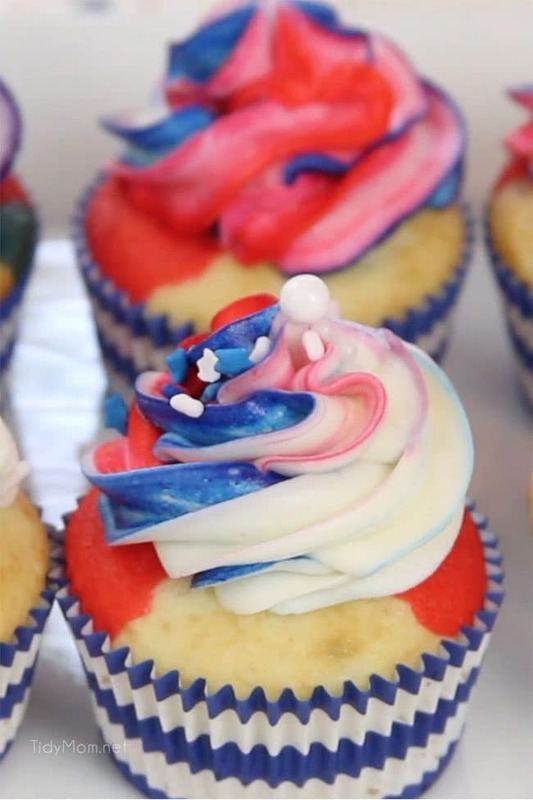 Just look at how these red white and blue cupcakes bake up! You can easily change the colors and make these for a graduation party in school colors! I used a new small paintbrush and lined the inside of a pastry/decorating bag with 2 stripes of each, red and blue gel color. I then filled the bag with my white frosting and piped my cupcakes using my Wilton 1M tip. I did add some fun patriotic sprinkles to some, that I found in the Dollar Spot at Target a while back, and topped all of them with these little red pin-wheel toppers I picked up at WalMart. See how fun they look when you bite in! 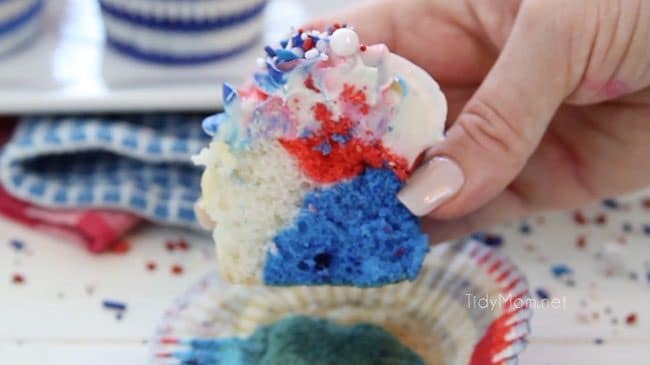 CHECK OUT HOW EASY THESE RED WHITE AND BLUE CUPCAKES ARE TO MAKE! WATCH THE VIDEO! I’m going to make these again this weekend as our family all gather’s at our family log home. While we celebrate with yummy food, I cannot help but think about the life of freedom we have today that is due to all of the people who gave (and are still giving) the ultimate sacrifice in order to protect our country. I appreciate their dedication and sacrifices from the bottom of my heart. It is because of them and their families that we can fly our flags high and be thankful that we live in the U.S.A.
Click here to find more Red White and Blue ideas for 4th of July. 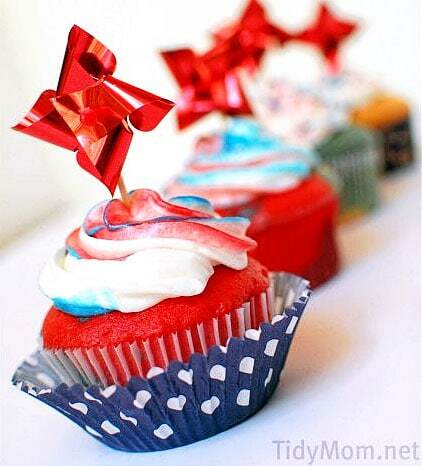 Like this Red White and Blue Cupcake Recipe? Pin It! 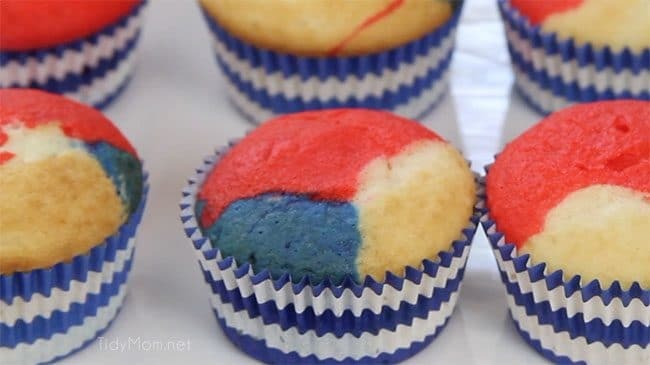 PRINT THE RECIPE FOR RED WHITE AND BLUE CUPCAKES! Preheat oven to 350°. Line cupcake pan with cupcake wrappers. Divide prepared white cake mix into 3 bowls. Add red gel coloring to one, and blue color to another. Spoon a little of each color batter into your cupcake liners, filling about 1/2 full. Bake 20 mins. and let cool. For frosting: Place butter in a large mixing bowl and beat slightly. Add cream cheese and blend until combined, about 30 seconds. Place a 1M tip in a 16-inch pastry bag. 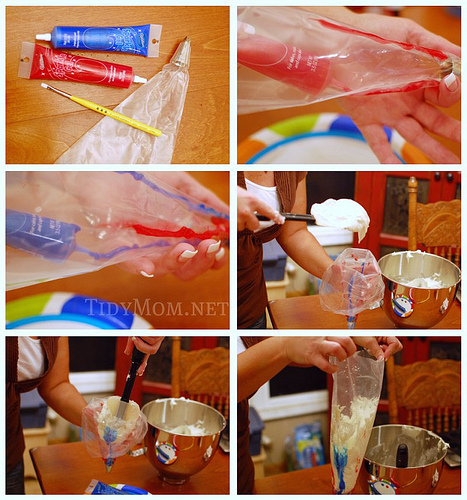 Using a small paint brush, lined the inside of the pastry/decorating bag with 2 stripes of each, red and blue gel color. The cupcakes look amazing! Can't wait to treat my family and friends with this! U Rock! These are just wonderful and delicious looking!! So patriotic and fun!! I have some of those pinwheels/cupcake liners from Wal Mart too:) They're so fun! LOVE your RB&B cupcakes and icing! Happy Independence Day to you! Thanks again for this. I made some today for our campout! Blogging about it Sunday and linking to you! Thanks! Wow these are amazing. So creative and cute! I mentioned this post on my blog today. I'm a day behind with the holiday and travel in letting you know you made this week's Top 5 Hits at Singing With Birds. Please come by, check it out, grab a blog button and happy, happy fourth! These are so adorable, and puffed up beautifully but as soon as I took them out of the oven they deflated! What did I do wrong?? Great recipe and my friends raved about the cupcakes! These cup cakes were fun to make and fool proof! Everyone at the picnic loved them. I can't wait to experiment with more colors for different holidays. I would use less confectioners sugar in the frosting though, it was a little too sweet. Otherwise, delicious! Too cute! What a great concept! this really looks amazing, i would like to taste one like this. O well these are cute !! 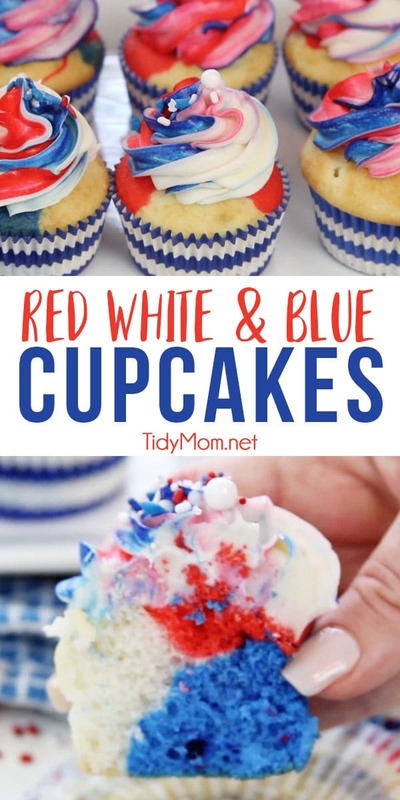 Stopping by to let you know that your Red White and Blue Cupcakes have been featured in my Patriotic Round-up of recipes and craft ideas. This is an excellent list! I will be making a lot of these ? I’ve done some already! Homemade always tastes better. 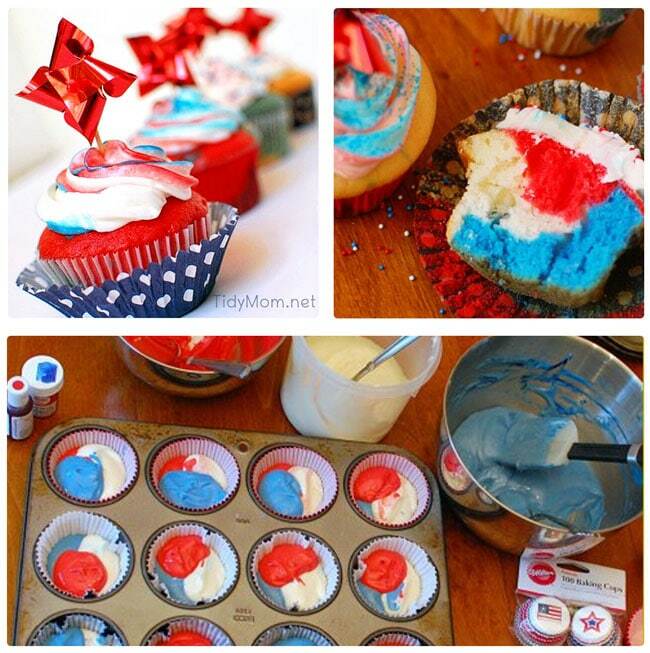 Love the red, white , and blue cupcakes! I made them in honor of our granddaughter who is in the Air Force , her husband who is in the Army, and another relative in the Navy. Wish they were home to enjoy them but I will send them pictures! ?? I made them and they came out great. Just like the picture. Bonus easy enough for my nine year old to help! !